Avial (aviyal) is the real star among the curries served in Sadya. 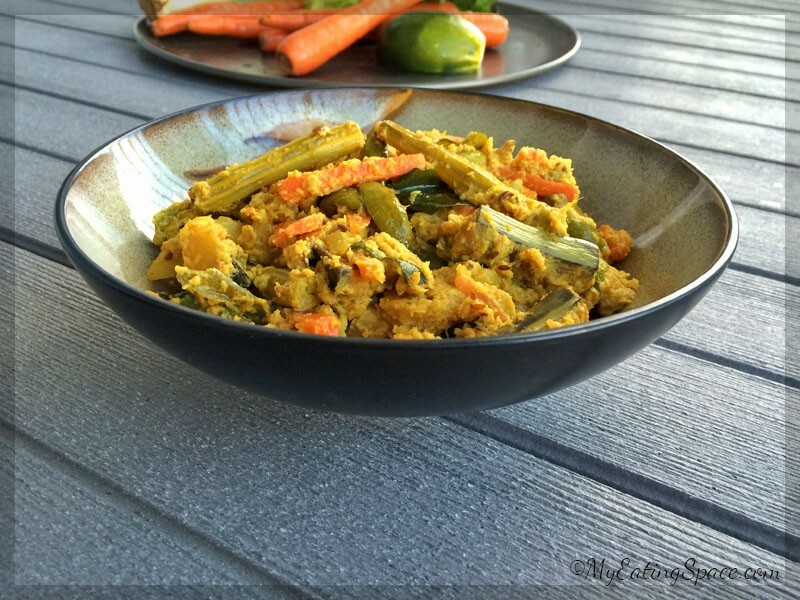 Avial is a mix of vegetables cut into matchstick length with ground coconut gravy. For a tangy flavor, we add tamarind water, yogurt or unripe mango into avial. The dish is believed to be originated in Kerala, but they are famous in Tamil cuisine as well. Usually, locally available vegetables are used to make avial. The beauty and simplicity of the dish is that you can make it with almost any vegetables you have on-hand. The custom vegetable combinations are raw plantains, yams, drumstick, lemon cucumber, potato, green beans, carrot and snake gourd. 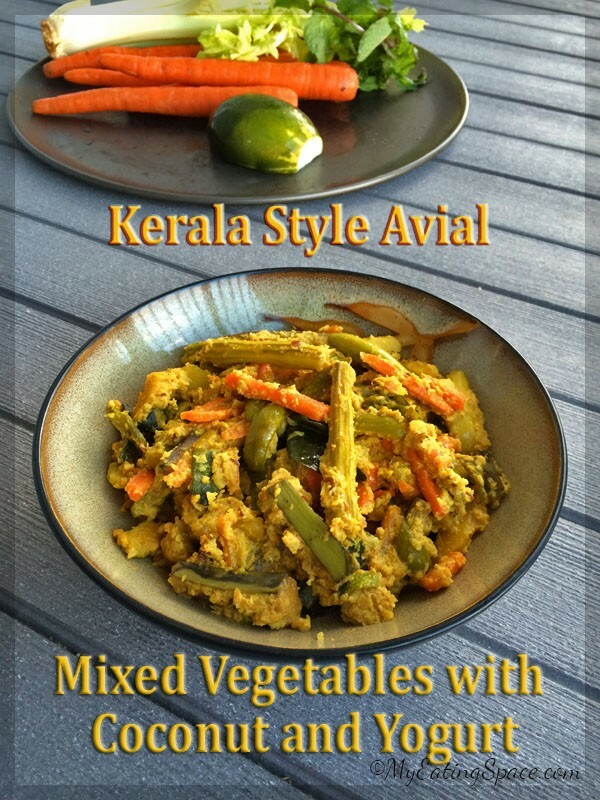 But after coming to the US, I have prepared avial with those veggies I get cheaper here like bell pepper (capsicum),today’s post is about how avial is made in Kerala although some vegetables (yam, snake gourd) are missing. celery. 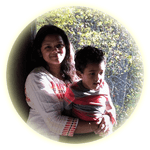 In this avial recipe, I am using yogurt to add the tangy flavor. In some places in Kerala, tamarind or unripe mango is used instead of yogurt. Whatever you add, the motive is same. I chose yogurt since it is hassle-free and can easily adjust the sour taste to our choice. So let’s look to the recipe video of making avial. 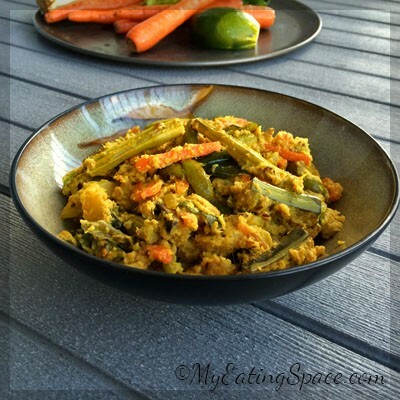 Avial is a dry side dish made with lots of vegetables mixed with thick coconut paste and yogurt. The veggies make it the most nutritious side dish in Sadya. This is an important dish in Onam sadya. Wash all the vegetables. Cut them into 2-inch length pieces. Grind together coconut, green chilli, ½ tsp cumin seed and water to make a smooth paste. Heat 2 tbsp oil in a large vessel. Crackle ½ tsp cumin seed. Now add the potato and plantain pieces into the oil. Cook for 2 minutes. Now add the remaining vegetables and salt into the pan. Mix well. Cover and cook on medium heat until the vegetables are half cooked. Add turmeric powder and chilli powder (cayenne pepper powder) and mix well. Again cook covered for 3-4 minutes. Then add the ground coconut paste and mix well. Mix gently so that the veggies will not get mashed. Again cook covered for 5 minutes. Remove from heat. Add curry leaves and 1 tbsp coconut oil. Mix well. When it is cool, add the yogurt and again mix gently. The delicious and nutritious avial is ready. You can opt for any vegetable you like to prepare the avial. Whatever vegetables you use, your avial will be the star in Sadya. The magical taste is the effect of these three things; the ground coconut paste, raw curry leaves and finally the raw coconut oil drizzled into the cooked veggies. A combination of these three ingredients makes avial tempting and irresistible. Onam is roaming around. Try the avial recipe for this Onam.